Alan Sidney Patrick Rickman (21 February 1946-14 January 2016) was an English actor and theatre director. He was a renowned stage actor in modern and classical productions and a former member of the Royal Shakespeare Company. 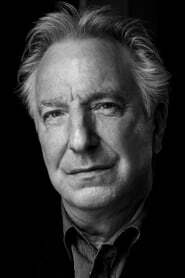 Rickman was known for his film performances as Hans Gruber in Die Hard, Severus Snape in the Harry Potter film series, Eamon de Valera in Michael Collins, and Metatron in Dogma. He was also known for his prominent roles as the Sheriff of Nottingham in the 1991 film, Robin Hood: Prince of Thieves, and as Colonel Brandon in Ang Lee's 1995 film Sense and Sensibility. More recently he played Judge Turpin in Tim Burton's Sweeney Todd: The Demon Barber of Fleet Street and voiced the Caterpillar in Tim Burton's Alice in Wonderland. Description above from the Wikipedia article Alan Rickman, licensed under CC-BY-SA, full list of contributors on Wikipedia.